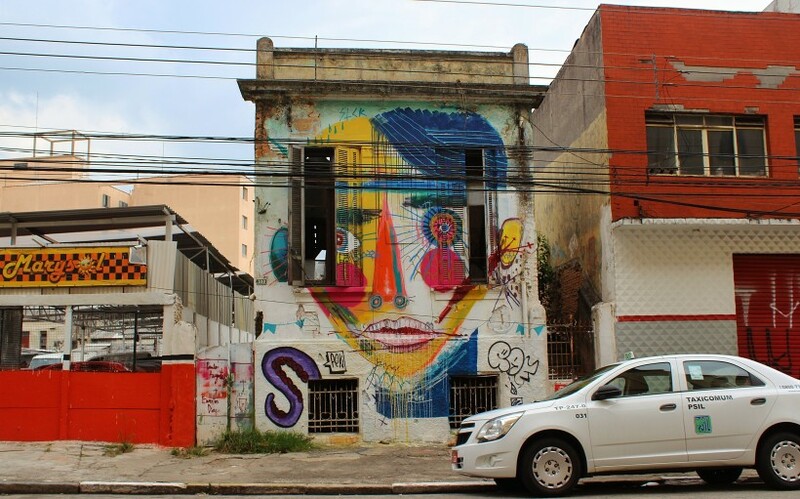 Os Gemeos in Cambuci, April 2015. 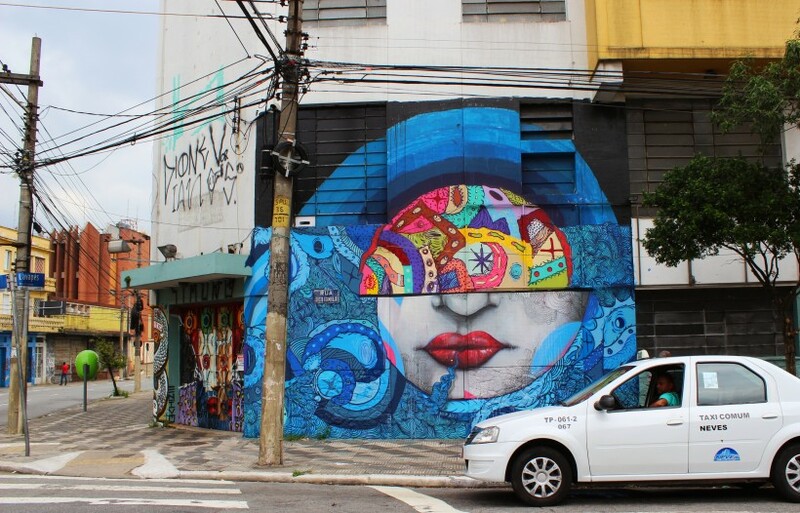 These three neighborhoods are absolutely full of graff, street art and pixaçao! 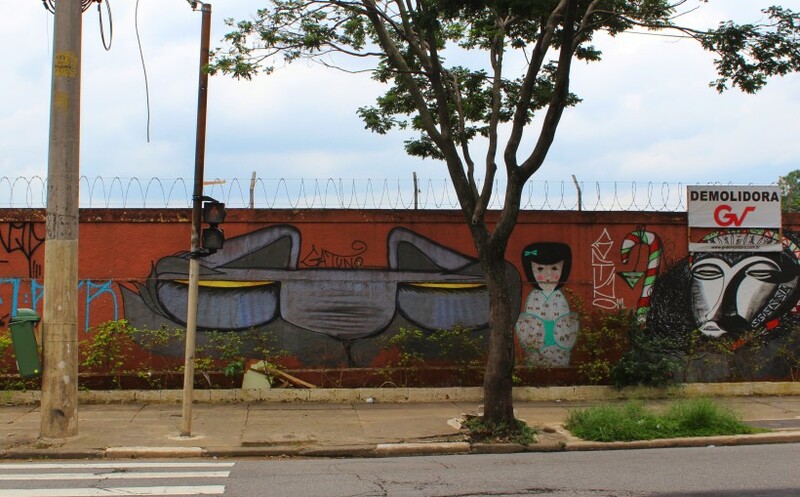 Liberdade is home to the Sao Paulo version of “Chinatown” and on the weekend there’s an asian street market right by the Liberdade subway station that’s worth a visit. 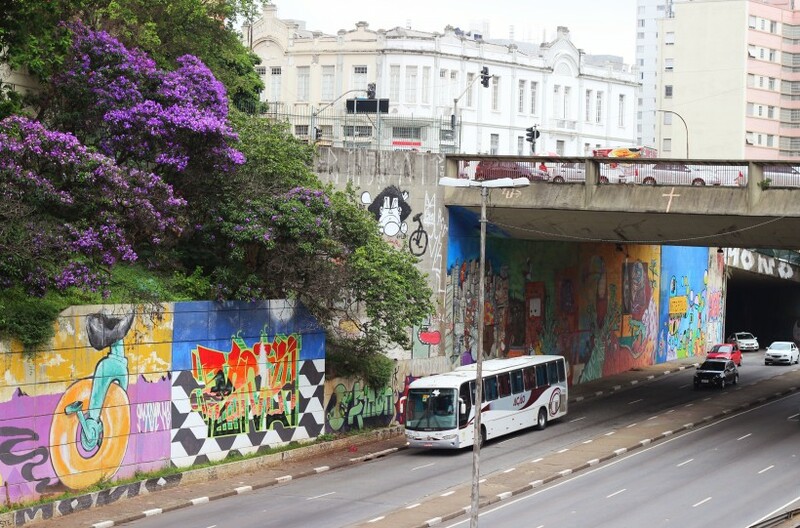 There’re also some overpasses that give you an amazing view of the Avenida 23 de Maio, a inner-city highway completely covered in public space take over, some legal, some not! 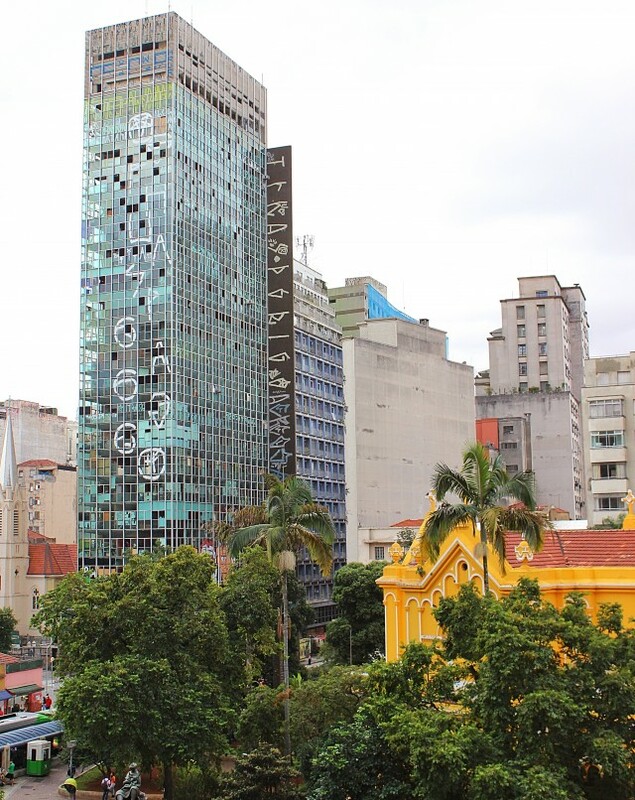 Liberdade is full of restaurants and shops with asian food and nicknacks, it’s a great place to do some people watching and public space take over of your own. 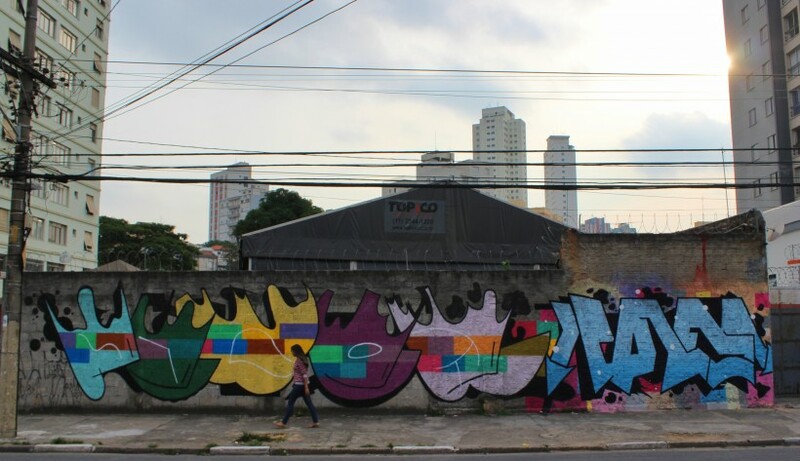 Large Os Gemeos mural, from some years ago, in Cambuci, April 2014. 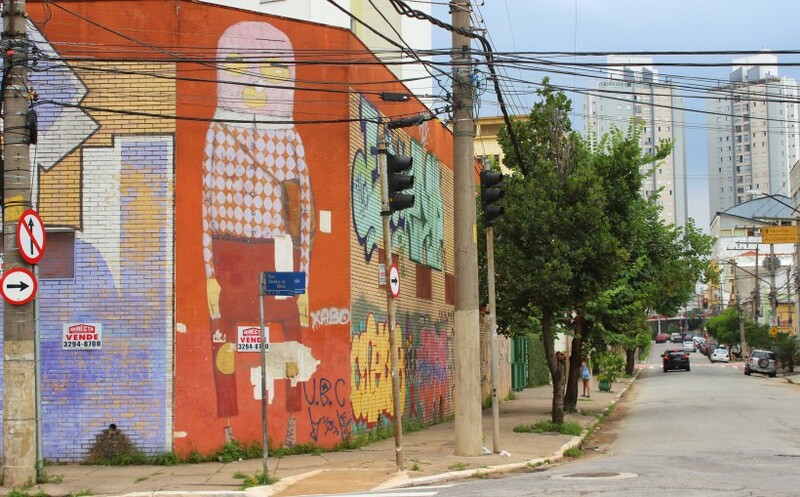 From Liberdade it’s a little bit of a walk to the neighborhood Cambuci, but it’s a great walk. I started at the Sao Joaquim subway station and just walked down. 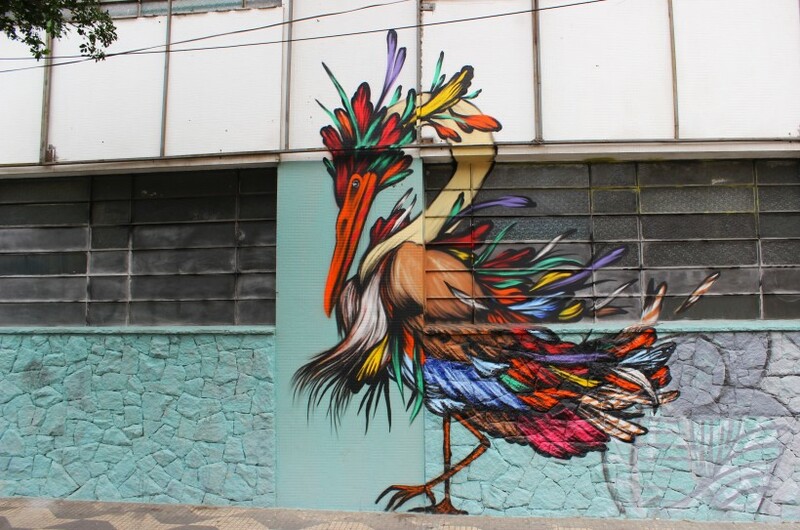 Cambuci is or was home to Os Gemeos and there’s loads of their work around. Older murals, newer stuff, tags, throws and pieces. 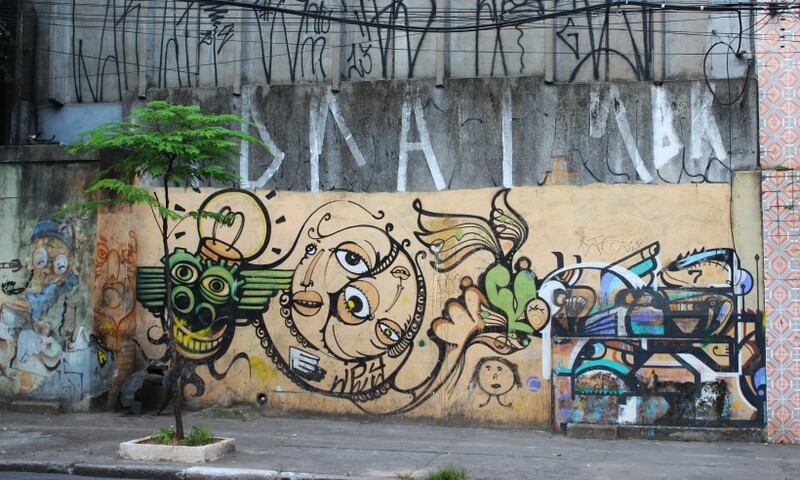 Not only them though, I found really good graff here, from the best writers in Sao Paulo. Cambuci is not a very touristy area, but it is most definitely worth a visit, bring your walking shoes! 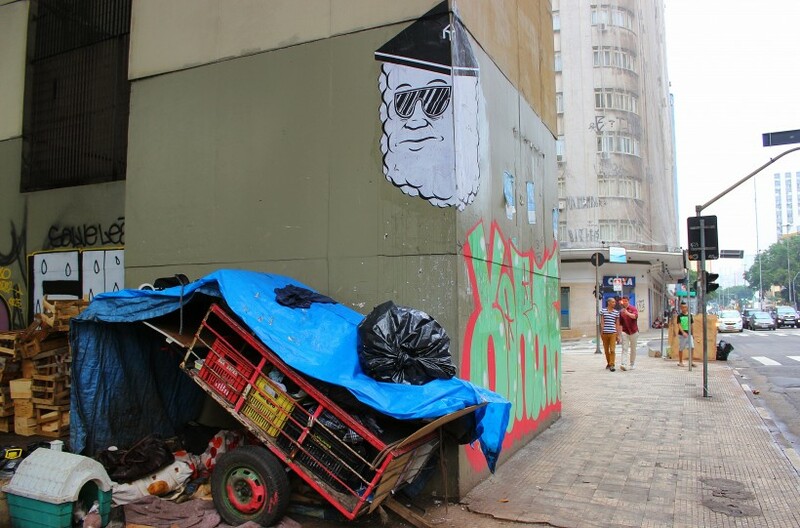 Downtown Sao Paulo is a good idea during the daytime. You can take the subway to Republica or Sao Bento and walk around. 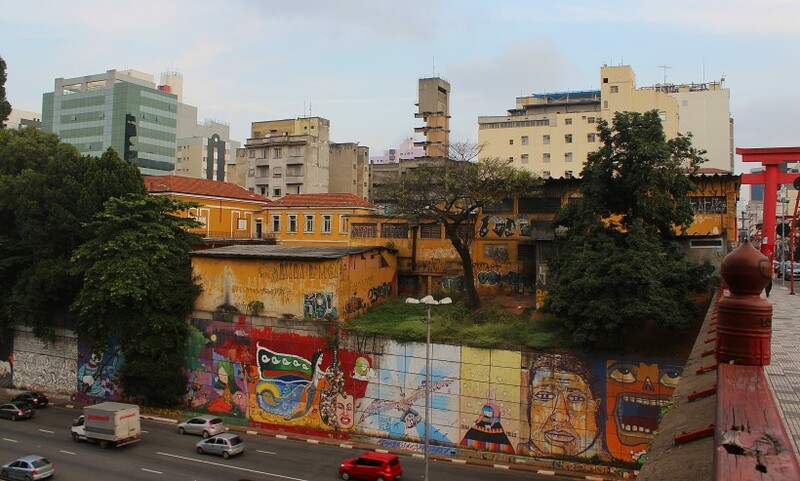 The area is covered in pixaçao, most of the buildings are from the 50’s and 60’s and the architecture is perfect for climbing the outside walls of buildings. 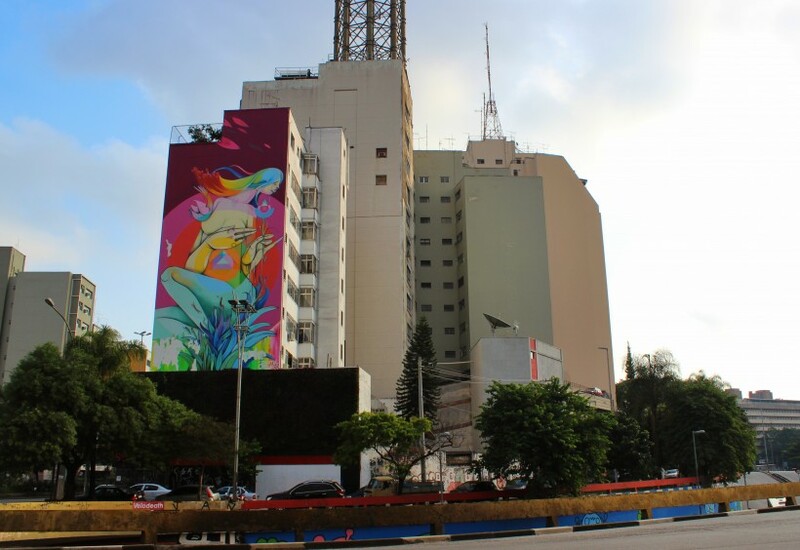 Visit the Edificio Itália on Avenida Ipiranga 344, every day between 15.00 – 16.00 they open the terrace to the public and the view of Sao Paulo is absolutely breathtaking. Even after weeks in this city, it wasn’t until I went up there I grasped the hugeness of SP! 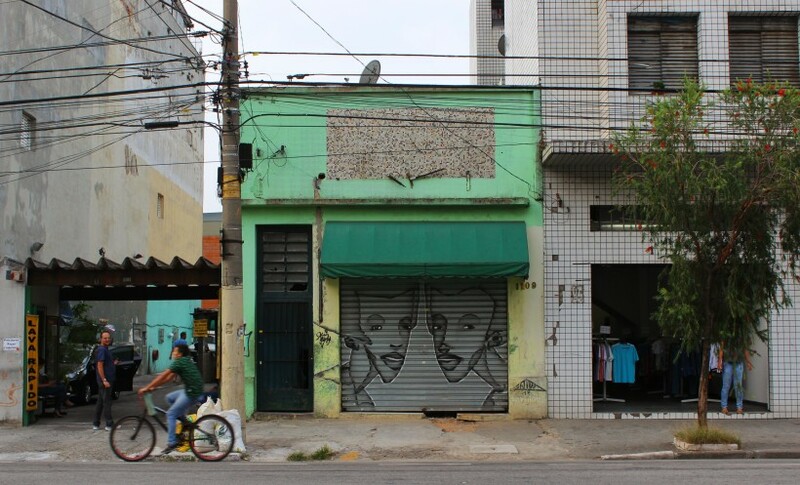 The Galeria do Rock a couple of blocks away is also a good place to visit, there’s a graff-shop and loads of street wear stores. It’s on Avenida São João, 439 and the view from the top floor is also very cool. Downtown SP is the oldest part of Sao Paulo, there’s really nice architecture and most government buildings are here. The Sao Paulo Cathedral by the Sé subway station is gorgeous, and I’m not much for churches at all. The Mosteiro de Sao Bento by the subway station with the same name is also wort a look, from the outside. 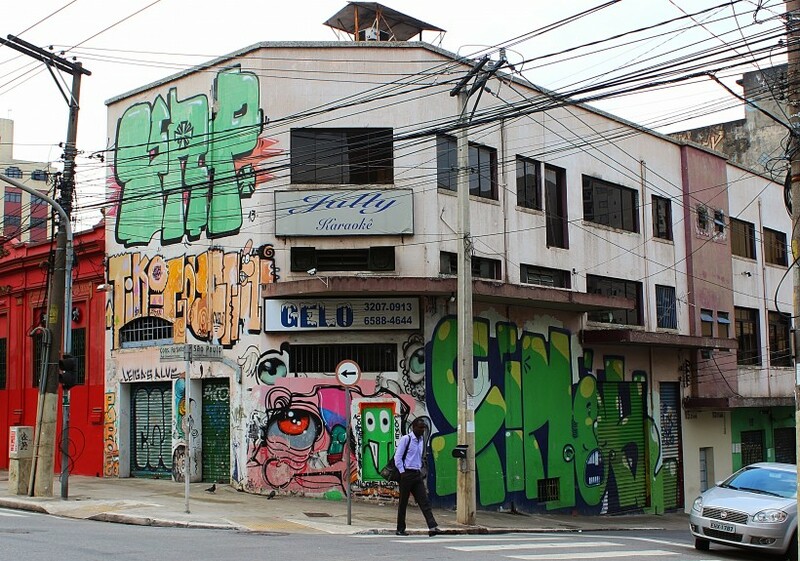 It’s the first religious building I’ve seen covered in tags, pixaçao of course! 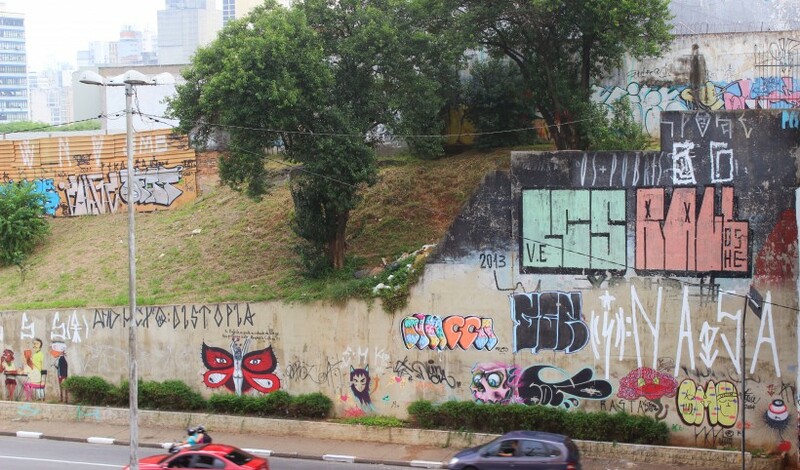 The breathtaking walls of Sao Paulo… Avenida 23 de Maio. April 2015. 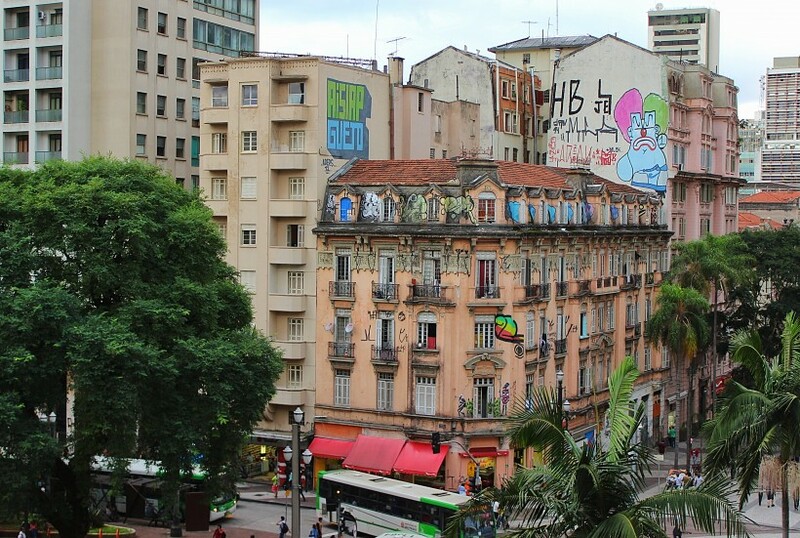 Downtown SP, view from Galeria do Rock, April 2015. 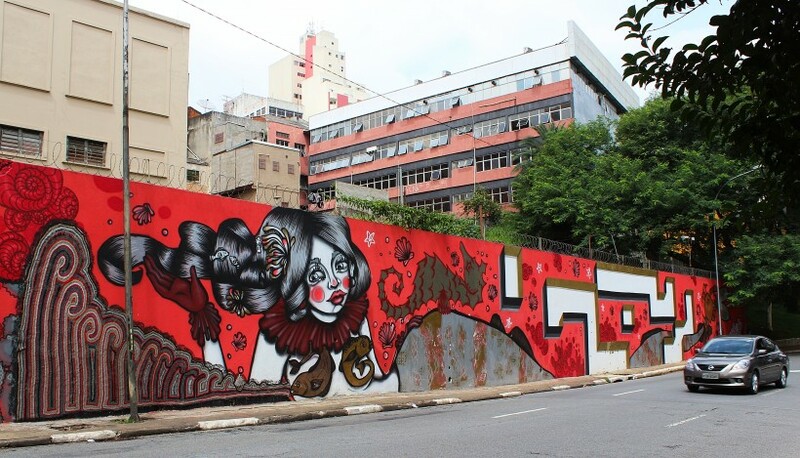 Liberdade, Avenida 23 de Maio. April 2015. 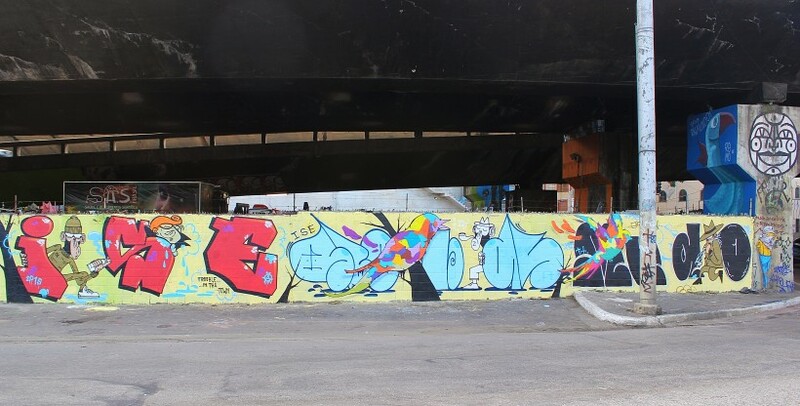 Enivo in Cambuci, April 2015. 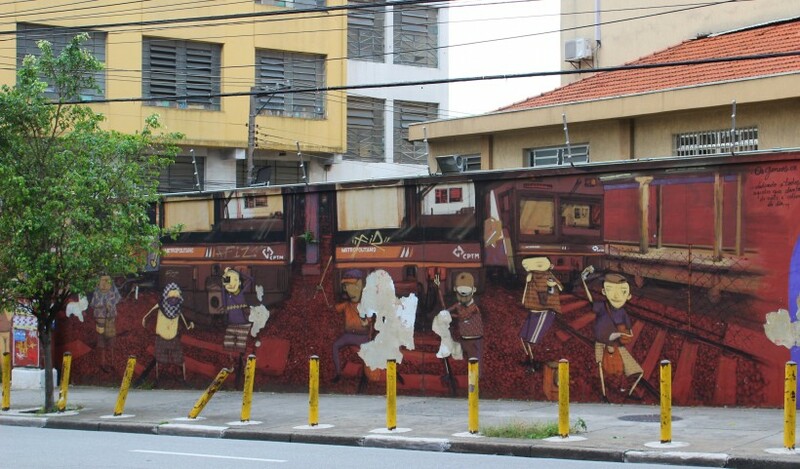 Scola, Ise, Mudo, Felipe Risada and Os Gemeos in Liberdade/Cambuci, April 2015.